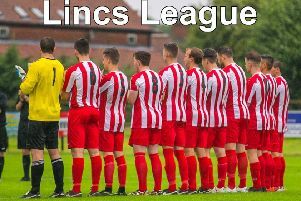 Skegness United Development lost their 100 per cent record and top spot in the East Lincs Combination Division Three following defeat to Grimoldby. It was the away side who moved up from second to leapfrog United following their narrow victory. United started on the front foot and could have gone a goal up in the opening three minutes when Tom Pickett was played in. However, the visitors’ goalkeeper was quickly off his line to block the shot. The half continued with the home side having another three one-on-one chances, two for Pickett and one for Sam Walker, but each time they were denied. However, it was not all one way with Grimoldby having half chances of their own. They should have scored when a ball across the United area was sliced wide when it appeared easier to score. Then with half time approaching Grimoldby took the lead when, from a corner, the home defence failing to clear and allowing Phil Steel to nip in and net from close range. At the start of the half United brought on Corey Cunliffe and Matt Davies for Daniel Briggs and Jamie Wolstenholme. For the majority of the second 45 United attacked the Grimoldby goal but could not find a way past the in-form keeper, along with the help of some resolute defending. As the game wore on, United restored to long range shots which were off target or straight at the keeper. It was only in the last 10 minutes that Grimoldby came back into the game. Then with seconds remaining United had a good chance to take something from the contest but, from a corner, Pickett fired straight into the keeper’s arms from three yards out. UNITED: Thompson, Gray, Haynes, Howitt, Kendrick, Paul, Walker (Kilner), Briggs (Davies), Clarke, Pickett, Wolstenholme (Cunliffe); Subs (not used): Bailey, Leatherland. On Saturday the Development side travel to face Sutton Vets (KO 2.30pm).